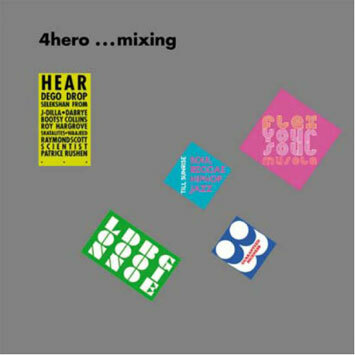 With the outstanding success of the two first "…mixing" compilations from Jazzanova and Âme, it would be a hard task finding the next artist that could bring something special for the third in the series, and keep raising the bar - enter Dennis McFarlane (aka Dego) of 4hero. With his partner Mark Clair (aka Marc Mac), 4hero have changed the face of music and made a huge contribution to dance culture. They were regarded as pioneers of jungle and drum'n’bass after their first album "In Rough Territory", and haven’t stopped innovating since. In more than 20 years they have released 6 albums and set up 5 different labels: Reinforced, Raw Canvas, 2000 Black, Omniverse and Twisted Funk. Their album "Parallel Universe" was named NME Album of the Year, and "2 Pages" (released on Gilles Peterson’s Talkin’ Loud label) was nominated for a Mercury Prize Award, and won them a MOBO Award in 2001. They recently released "Play With The Changes" on their own Raw Canvas label, which received a critical acclaim in UK. On "…mixing", 4hero investigate their musical influences; past, present and future. Things start off on a funky note with Bootsy Collins (who played earlier on in his career in James Brown’s band) and the infectious P-funk of "Fat Cat". Detroit hip hop is covered with the incredible "Game Over" and the inimitable J Dilla’s "Over The Breaks", taken from his legendary posthumous album The Shining. Then it’s back in time with the electronic music of composer and inventor Raymond Scott, regarded by many as a major influence for musicians such as Robert Moog, Aphex Twin and Boards of Canada. This childish atmosphere is broken with the disco-funk of "High Noon" by Two Sisters from the Carrere imprint of 1983, made of analogue drum beats and keyboard sounds. This is followed nicely with the soulful voice of Face and the break beats of "Act Like All Is Right". The second part of the mix begins with the exceptional roots-reggae sounds of Jamaican dub mixer Scientist aka Hopeton Brown. "Blood on his Lips" is a slow instrumental tune with a fat drum beat giving the pace, choppy guitar riffs and some nice guiro sounds in a pure roots-reggae style. For "Roots Dub", The Skatelites make great use of their studio effects, with echoes on trumpet, flute and guitar riffs, creating a special sound that had influenced every reggae, dub and broken beat artist since. Once again, Dego switches styles with the wonderful voices of disco legend Patrice Rushen with "Message In The Music" and Georgia Anne Muldrow with "Blackman". Sa-Ra’s remix of Roy Hargrove’s "On The One" is modern soul at its finest, before the compilation ends with the calm and dubby hip hop of "Nighttime Maneuvers" by Little Brother, and "Make Doe" by Detroit producer Waajeed, a brand-new anthem from Fat City records. From new to old Dego teaches us that Black music is constantly innovating but never forgetful of its roots. If you want proof that Black music is always evolving, look no further than 4hero "…mixing".